When I was invited to write a product review for a dishwashing liquid, the first thing that I had to do was to convince my mother to try a new brand. Everyone in the family was open to try out something new but my mother ( who washes the dishes more often ) was more difficult to convince. She didn't want to try a new brand because, in her own words -- "Hiyang na ako sa ----- (mentions the leading brand)! Bakit pa tayo susubok ng iba? I told her that teaching my five-year old son how to wash the dishes was part of our homeschooling activities so we need to try using a dishwashing liquid which is safe for his sensitive skin. I have read some reviews about Bubble Man Dishwashing Liquid and I would love to know myself if it's indeed safer and eco-friendly. It would be our perfect partner in teaching our son an important house chore. In short, I was able to convince Rio's Lola to dump her trusted brand and use Bubble Man Dishwashing Liquid. Lola waited for me to come back from my week-long conference before she opened and used Bubble Man ( Lemon ) to wash our dishes. For the record, we started using this Lemon (yellow) variant last June 21 and the dishwashing liquid lasted until yesterday! It gave our family two weeks of easy to rinse and gentle on hands dishwashing experience. We are all excited to try Bubble Man Antibac (blue) this week to help us choose the best variant or scent for our dishwashing needs. My husband has this one comment to share about his experience in using Bubble Man : "Mahal, parang Perla ang ginagamit ko kanina habang naghuhugas ng plato." What do you mean, mahal? "Hindi matapang itong Bubble Man sa kamay pero nalilinis nang maigi ang mga plato," he explained. I remembered we use Perla to wash Rio's baby clothes. His pediatrician advised us to use this soap because it's safer and not as harsh or strong as other detergent bars. 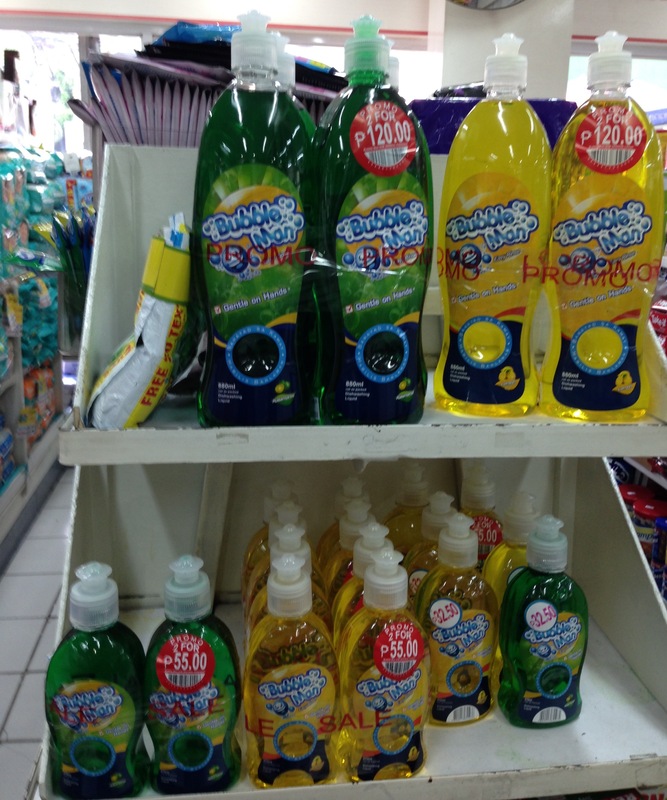 I know you are more interested to know about my mother's views and experience in using Bubble Man Dishwashing Liquid. So, Lola M, take it away! Hindi masyadong mabula kaya madaling banlawan. She was excited to tell me how she was able to conserve water because Bubble Man made it easier for her to rinse the dishes. "Konting banlaw lang, wala nang dulas agad." This was definitely good news for the family especially if it will make our water consumption lower and our bill cheaper too! Mas mura ba ito? Ito na lang ang gamitin natin! I was not able to answer my mother about Bubble Man's price because I haven't seen this new brand displayed in shelves during our recent grocery trips. But not until yesterday while I was checking one of the leading drugstore's grocery shelves, I saw stocks of Bubble Man and true enough, its price is more affordable and lower than the leading brands. When I got home, I finally answered my mother's question. "Nay, 'di hamak na mas mura ang Bubble Man!" 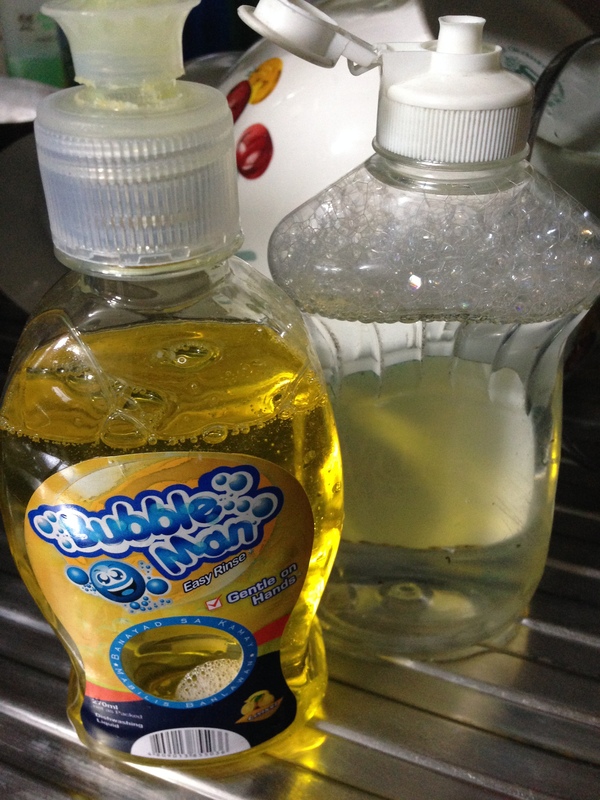 Thank you to my dear friend May of Fully Housewifed who included Nanay's Trip as one of the blogs to post a product review on Bubble Man Dishwashing Liquid. Thank you to Ms. Jennifer Dizon and Mikewell World of Household Products Company for sending me samples of Bubble Man Dishwashing Liquids for review.